"This recipe has been in my family for generations. It's incredibly delicious with a wonderful spice flavor. Try to use coffee cans to bake them in - makes all the difference in the world! A wonderful Christmas gift." Preheat oven to 350 degrees F (175 degrees C). Grease and flour 3 - 1 pound coffee cans. Sift together the dry ingredients . Evenly distribute the batter between the coffee cans. Bake at 350 degrees F (175 degrees C) for 50-55 minutes or until a toothpick inserted in center comes out clean and top of bread is browned. Cool bread in coffee cans on a rack for 15 minutes. Remove bread from cans by running a knife around the inside and turning can upside down to dislodge bread (should slide right out!). Cool completely. Learn how to make this classic seasonal treat--holiday pumpkin bread. I would have used applesauce or butter instead of Oil. The bread looked wonderful, but all I tasted was oil! 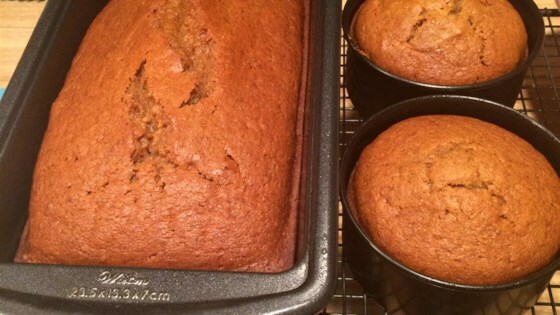 This Pumpkin bread recipie is great! I used regular loaf pans and also added 1 tsp. of ground cloves. I only wish it would have called for chopped nuts. this bread is ridiculously delicious! I have made this twice already and really enjoy it. It has a great flavor. Next time I might try adding some chopped nuts. We love this recipe. I have now made 15 loaves for family and friends for Christmas. It was a huge success at Thanksgiving as well.